JLS International College is a medium-size college for training foreign students English and the cultural nuances of North American society. 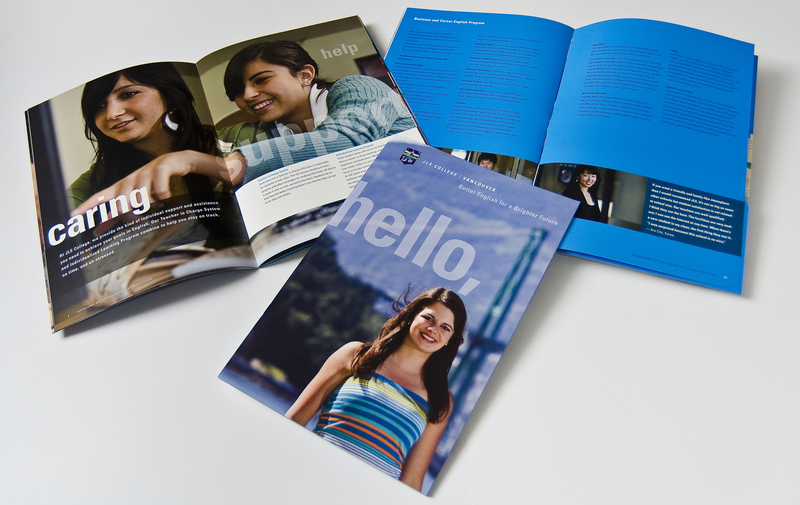 The two main goals for the brochure were to set it apart from its many similar-sized competitors in Vancouver; and to diversify the nationalities of its student base. Together with the client, we identified the school’s key unique strengths and advantages that set it apart from its competitors. We also looked at areas of potential growth and developed a core message that would become the theme throughout the book. Bearing in mind the intended audience does not use English as a first language, the photos had to tell a motivating story. Information was layered to be as accessible as readers’ language skills allowed. Yet the overall look and feel had to say a visiting student would find inclusion and have a fabulous time outside the classroom while getting a top-quality education that would improve his/her career options. Currently, JLS is experiencing an increase in enrollment as a direct result of its new brochures. The client says the brochure is flying off tables at educational trade fairs and is establishing a niche apart from its competitors.